From Portugal comes the news that SilicoLife was awarded with a SME instrument phase 1 grant for the commercial evaluation of its BUTANOVA technology, a new biological process to produce n-butanol. The news prompts one to ask, what became of butanol? In its isobutanol and n-butanol versions, we’ve seen numerous companies set forth on a butanol journey and we have yet to see massive commercial volumes of it. The problem, more or less, has been the cost of production. In part, think “low oil prices” and “production scales too small to provide economies of scale”. In part also, there have been rough passages from technology-in-the-lab to technology-at-scale — cost overruns, disappointing yields or rates. Now, oil prices are on the rise again, Brent crude has jumped to more than $80 a barrel and retail premium gasoline has spiked to $4.14 a gallon near to Digest headquarters in Florida. Much higher, and we’ll begin to hear more about fuel-switching and electric-switching and fuel-efficient cars, as we have not heard so much in these 6 years of cheap oil. Those familiar with butanol, its markets and applications can skip over the next paragraph of backstory. 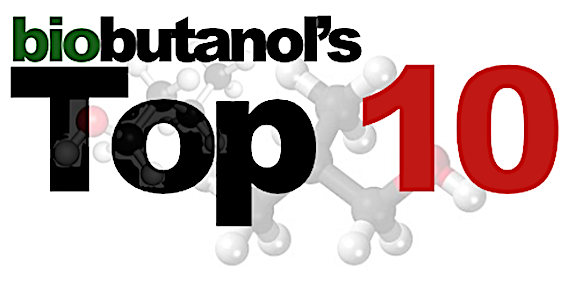 The butanol backstory: Butanol is a 4-carbon alcohol generally used as an industrial solvent with a growing market, valued over 5 Billion € annually, and with a high potential as a renewable fuel. It is commonly produced from fossil material through pollutant processes, and thus requiring more sustainable and greener production alternatives. Biobutanol is a second-generation fuel with a higher energy density and lower corrosiveness and volatility than ethanol. In June we reported that the Environmental Protection Agency announced the approval of isobutanol at a 16% blend level in gasoline for on-road use in automobiles. Previous to this isobutanol had been approved for on-road use up to a 12.5% blend. In June we reported that Kreussler Inc. is working with Green Biologics and their facility in Minnesota to make a new biobased dry cleaning solvent, called SYSTEMK4, from corn grown by about 500 family-owned farms in the heartland of America. Green Biologics will use their patented fermentation process to take locally-grown feedstocks from family-owned American farms and convert it through a low-energy, minimal waste process into the bio-based n-butanol used to produce SOLVONK4, the main solvent in the SYSTEMK4 dry cleaning process. SOLVONK4 will now be sustainable and bio-based while retaining the award-winning cleaning attributes of the original formula. Worldwide patented SOLVONK4 is the first and only bio-based solvent in the dry cleaning industry. Kreussler is actively applying for the USDA BioPreferred certification. In February we reported that Green Biologics Inc. announced an exclusive collaboration with Jungbunzlauer Ladenburg GmbH, the German operating unit of Jungbunzlauer Suisse AG in Basel, Switzerland. In February 2017, Jungbunzlauer received its first shipment of 100 percent renewable BioPure n-butanol from Green Biologics’ production facility in Little Falls, Minnesota. Jungbunzlauer aims to produce biobased Citrofol BI (tributyl citrate) and biobased Citrofol BII (acetyl tributyl citrate) for its customers with commercial shipments beginning next month. Green Biologics announced the start-up of its first commercial production facility for renewable n-butanol and acetone in December, with its first bulk export shipment to Jungbunzlauer in mid-January. In February we reported that Gevo announced that it has strengthened its existing relationship with Musket Corporation, a national fuel distributor under the umbrella of the Love’s Family of Companies, by amending its existing isobutanol supply agreement to provide Musket with the exclusive right to sell Gevo’s renewable isobutanol within a 300-mile radius of Houston, Texas. This agreement establishes a market region that encompasses Austin, Dallas, Fort Worth, Oklahoma, Louisiana, as well as the majority of South and East Texas. In April 2017 we reported that Butamax Advanced Biofuel, a 50/50 joint venture between BP and DuPont, combining expertise in fuels with industrial biotechnology, announced the acquisition of Nesika Energy, LLC and its state-of-the-art ethanol facility in Scandia, Kansas. Butamax will now start the detailed engineering work to add bio-isobutanol capacity to the facility, while continuing to produce ethanol before and after adding this capacity. “To drive growth in U.S. manufacturing, we must employ disruptive thinking and innovation to unlock the power of renewable raw materials,” said William F. Feehery, president, DuPont Industrial Biosciences. “With the purchase and planned build-out of the Nesika facility to include bio-isobutanol production, Butamax is taking the next step forward in advancing the bioeconomy, which supports economic growth and opportunity in rural communities. In December we reported that chemists at the University of Bristol have made the first steps towards making sustainable petrol using beer as a key ingredient. Scientists from the University of Bristol’s School of Chemistry have been working for several years to develop technology that will convert widely-available ethanol into butanol. Last July we reported that Praj Industries Ltd and Gevo, Inc. unveiled a new commercial opportunity in renewable bioproducts, jointly announcing that Gevo’s proprietary isobutanol technology will now be available for licensing to processors of sugar cane juice and molasses. This follows on the back of Praj’s development work, adapting Gevo’s technology to sugar cane and molasses feedstocks. A Joint Development Agreement and a Development License Agreement were entered into between Praj and Gevo in November 2015. The goal of these agreements was for Praj to adapt Gevo’s isobutanol technology to using non-corn based sugars and lignocellulose feedstocks. The process technology development was performed at Matrix, Praj’s R&D center located in Pune, India. In October we reported that Gevo and Los Alamos National Lab will collaborate to improve the energy density of Gevo hydrocarbon products to meet product specifications for tactical fuels for specialized military applications such as RJ-4, RJ-6 and JP-10, which are currently purchased by the US Department of Defense (DoD). High energy-density fuels are currently used in air and sea-launched cruise missiles used by the US military forces. If this project is successful in scaling the fuels cost-effectively, there may be an even broader application in the general aviation sector, enabling higher energy density jet fuel that would provide superior mileage to traditional aviation fuels. In June we reported that US Environmental Protection Agency Administrator Scott Pruitt approved the registration of bio-isobutanol as a fuel additive. May’s American Boating Congress featured a special question-and-answer session with NMMA President Thom Dammrich and Pruitt. “We applaud Administrator Pruitt’s approval of bio-isobutanol as a biofuel additive, which will provide consumers a safe, efficient, and environmentally-friendly E15 alternative that is highly compatible with marine products,” Dammrich said. “This decision will promote an innovative fuel supply, with direct benefits to American boaters and consumers. In May 2017 we reported that a bill signed by Arizona Governor Doug Ducey will let gas stations sell isobutanol-blended gasoline for on-road vehicles, enabling higher performing finished fuels with renewable content for drivers in the state. Bill HB2368 permits isobutanol to be used as an oxygenate in gasoline for on-road vehicles in Arizona. The new law takes effect in August 2017. While the law authorizes the use of isobutanol-blended gasoline for on-road vehicles, Gevo’s isobutanol is already being sold in Arizona for off-road applications such as boating, ATVs, motorcycles and landscape equipment.